How does one relate the standard scientific model to that presented in the Bible for the history of the Universe and Earth? This does not have an easy answer, but the Geoscience Research Institute will be addressing the question in several articles outlining the different parts of the geologic column. The standard divisions are: Precambrian with little life, Paleozoic with old life, Mesozoic with intermediate life, and Cenozoic with recent life. This series begins with the Precambrian and is based partly on Biblical Research Institute Science Council presentations and a field trip that occurred in 1993 at Glacier View Ranch south of Rocky Mountain National Park in Colorado. In the standard chronology of Earth’s geologic history, the Precambrian part covers by far the largest fraction of time – 88% of the total. This spans the time from 4.56 Ga to about 0.54 Ga, where “Ga” stand for giga annum or billions of years ago. The standard scientific timeframe is included because many conservative Seventh-day Adventist academics are comfortable with long ages for inorganic matter and believe that only life was created recently. This first section summarizes the standard model for formation of the Universe, Solar System and Earth, Moon, oceans, continents, and plate tectonics. Brief references to the Universe, Sun, and Moon are included because what happens beyond Earth sets the stage for what happens on Earth during the Precambrian and in the Genesis 1 account. Some of the terms and concepts addressed here are too complex to do them justice in a single article. For this reason, many web links and references are included to provide more detail and a more complete understanding. The outline of the standard model is based especially on The Story of Earth by Hazen (2012). Additional information is available from a scholarly volume on Earth’s Oldest Rocks edited by Van Kranendonk et al. (2007). The web provides additional resources such as Encyclopedia Britannica, Michigan State University, Live Science, an historical geology textbook website, a journal devoted to Precambrian Research, a YouTube video, a good summary timescale, and a few cartoons. 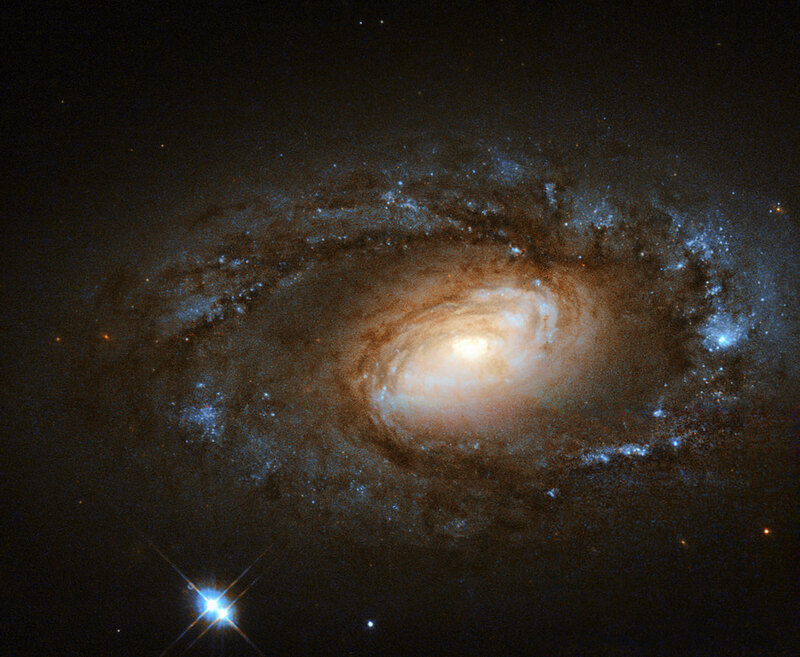 The NASA/ESA Hubble Space Telescope observes some of the most beautiful galaxies in our skies — This little spiral, known as NGC 4102, has a different kind of appeal, with its tightly-wound spiral arms and understated, but charming, appearance. NGC 4102 lies in the northern constellation of Ursa Major (The Great Bear). In the standard scientific model, the universe began at a Big Bang about 14 billion years ago. When an expanding universe was first suggested in about 1930, it was rejected by the scientific community because it seemed to suggest an effect without a cause pointing to an outside force like God. By the 1960s the Big Bang came to be accepted after the observation of microwave background radiation that could be explained by an initially hot, dense universe; however, scientists are still wondering (January 25, 2016) how the universe began and what came before the Big Bang. One creationist suggests that there is a crisis in cosmology (January 26, 2016). The Big Bang created quarks, which coalesced into protons and neutrons that then formed atoms such as hydrogen and an environment where light could travel through space. These hydrogen atoms clustered into stars which became hot under gravitational pressure and started burning by nuclear fusion, just as in a hydrogen bomb. The “burning” meant combining four protons or hydrogen nuclei (1H) together into helium (4He). After the hydrogen had been converted to helium, the helium started combining so that three helium nuclei would combine to form carbon (12C), but carbon must have a certain excited-state resonance energy for this to work. Before this resonance energy was experimentally observed, it was predicted by Fred Hoyle as a necessary fact for nature to produce carbon by stellar evolution. Now that this resonance energy has been discovered, it has been suggested as an evidence for the intelligent design of the carbon nucleus, but the argument must be used with caution. After 12C is produced, heavier elements were formed by the addition of more 4He nuclei to make such elements as oxygen (16O), magnesium (24Mg), silicon (32S), and iron (56Fe). Atoms heavier than iron require an input of energy, so did not form until the extra energy from a supernova explosion was available to produce atoms of iodine, platinum, gold, mercury, lead, uranium, etc. These stellar explosions seeded space with these elements, many of which are just exactly the elements necessary for life. Remnants of these stellar explosions formed clouds of gas and dust. One such nebular cloud with its mass all rotating in the same direction developed into our Solar System with a large central bulge forming the Sun and the remainder coalescing into planets. This Sun is the ideal size for life on earth: if it were ten times larger it would burn too fast, and if it were ten times smaller it would not provide enough energy. During Earth’s early stages, the Sun had only about 70% of its current light output. This might suggest a much colder early Earth, but evidence for liquid water at that time indicates that that was not the case. This warmer-than-expected Earth has been explained by a greenhouse effect and by the Earth absorbing a much higher percentage of the Sun’s energy in the past. A solar wind blew the lighter gases away from the Sun to where the gas planets of Jupiter, Saturn, Uranus, and Neptune now orbit. The heavier material remained closer to the Sun and accreted into meteorites and planetesimals (small planets) and eventually into the rocky planets of Mercury, Venus, Earth, and Mars. This formation of Earth occurred during the period of “heavy bombardment” by meteors in the Hadean (4.5-4.0 Ga). During this time the Earth differentiated into a denser iron/nickel core and less dense silicate mantle. A recent article (January 28, 2016) summarizes a book on the accretion and differentiation of the early Earth. About 10% of meteorites are iron that once formed the cores of planetesimals and 90% are silica rich chondrites that once formed their mantles. Present day examples of these early meteorites are most easily found in the Earth’s Antarctic ice fields and the Sahara desert. The largest known iron-nickel meteorite is the Hoba meteorite displayed near Grootfontein in Namibia. In the standard scientific model, the Moon formed within fifty million years after the development of the Solar System. It was once thought that the Moon formed by the breakup of the Earth, or by being captured from a solar orbit, or by accretion just as the Earth had. New data from Moon rocks in the early 1970s however, indicated that these theories were not satisfactory. The Moon lacked an iron core and volatiles like water, so its composition was too different from that of Earth. A new model that developed in the mid-1970s postulated that a small planet called Theia once occupied the same orbit as Earth, until it was captured by Earth and annihilated. The collisional debris thrown into space coalesced to form the Moon (see: Slattery, 1995; Choi, 2015). The impact from Theia was just right – not a miss, not too glancing, and not too head-on – and may have caused the Earth’s tilt of 23 degrees. Similar collisions may have caused Venus to rotate backwards and Uranus to rotate sideways. However, a recent article (January 29, 2016) suggests that the Moon was produced by a head-on collision. Initially the Moon is thought to have orbited the Earth at a distance of about 15,000 miles. At that time the Earth would have rotated on its axis every five hours, a solar eclipse occurred every 84 hours, and the Earth had monster tides. As the Moon moved away from the Earth at about 4 cm per year, the Moon orbited the Earth faster and the Earth’s rotation slowed due to conservation of angular momentum. Since the Earth is assumed to have formed from meteorites, the volatiles found in chondrites are expected to have existed in the early Earth – nitrogen, carbon dioxide, sulfur gases, and water. However, a large fraction of the expected volatiles seem to be missing, either lost to space from impacts such as Theia or deeply buried. Over the last thirty years it has been suggested that Earth’s deep interior may hold prodigious amounts of water. The mantle transition zone may contain as much water as nine times the Earth’s oceans and the lower mantle as much at sixteen times as much. Under the high pressures and temperatures deep in the earth, minerals incorporate hydrogen which, along with their oxygen, can produce water. This water content is evident in granitic magmas that commonly contain 1-4% water and volcanic lavas that cause explosive volcanism as at Mt St. Helens due to the explosive release of pressurized water vapor. According to the standard model, Earth’s early water came from the volatiles spewed out of volcanoes, so that shallow seas formed within a few tens of millions of years and oceans developed within 100 to 200 million years after Earth’s formation. The early oceans were saltier than today and apparently that salt has precipitated into salt deposits and evaporites – minerals formed from the evaporation of water. Water has the unique chemical properties necessary for life (Hazen, 2012). Among other properties, it is a solvent; it has high surface tension making capillary action in vascular plants possible; and it splits into hydroxyl (OH–) and hydronium (H3O+) ions important for acid/base pH reactions. Its high heat capacity decreases Earth's temperature fluctuations to a range acceptable for life. Unlike most substances, water expands on freezing; thus ice has a lower density than water and will float. If this were not the case, ocean basins would fill with ice from the bottom up. It is a basic ingredient in biochemical reactions in our bodies that are more than half water. Over the Earth’s history it has differentiated into a core, a mantle, and oceanic and continental crusts. The crustal plates are formed as magma rises from the mantle at spreading centers and volcanic arcs and destroyed as the tectonic plates descend back into the mantle at subduction zones. The differentiation and movement is due to gravitational effects on different density rock depending on their heat content and the arrangement of atoms in their minerals. The Earth’s rocks are made up of minerals and the minerals are composed primarily of six types of atoms: oxygen, silicon, aluminum, magnesium, calcium, and iron. One usually thinks of the oxygen in the atmosphere, but 99.99999% of it is in the Earth’s minerals. Silicon is to inorganic rocks what carbon is to organic life, since both form four bonds with surrounding atoms. These oxygen and silicon atoms together (SiO2 silica) are the primary constituents of the Earth and its silicate minerals. The early Earth was a hot magma ocean with the heat coming from the collision of meteor fragments, from gravity-induced tides, and from radioactive elements. The magma oceans cooled by conduction, convection, and radiation. The hot, early Earth differentiated based on density (in g/cm3) which is related to silica content. Higher silica content means lower density rocks, so rocks nearest the Earth’s surface are generally highest in silica. The differentiated Earth consisted of an iron core with negligible silica and a density of 10-13, a mantle with 45% silica and density of 3-4, and eventually a basalt crust with 50% silica and density 2.8-3.0. For comparison, later granitic rocks have a silica content of 60-75% and a density of 2.6-2.7. Seismology, the study of earthquake waves, is today able to identify a lower mantle made of the mineral perovskite with a density of about 4, a transition zone, and an upper mantle made of peridotite with a density of 3.1-3.4. During the first 50 to 100 million years, a basalt crust formed from 5% partial melting of the peridotite upper mantle. Rocks don’t have a single melting temperature and the first parts to melt have a higher silica content and a lower density than the remainder. The lower density basalt was more buoyant than the mantle and rose to the surface forming black volcanic islands in the Earth’s shallow seas. During the Archean from 4.0 to 2.5 Ga, plate tectonic activity began and the first small pieces of granitic continental crust called cratons formed. Life requires atmosphere, oceans, and land, but "You can't have continents without granite, and you can't have granite without taking water deep into the Earth … So at some point plate tectonics began and started bringing lots of water down into the mantle. The big question is when did that happen?" (see January 21, 2016 article). John Baumgardner suggests that catastrophic plate tectonics began at the Genesis flood. The heat energy driving tectonic activity came from convection in the mantle, but the trigger may have been an asteroid impact. This differentiation to granite is part of the trend of elemental separation and concentration: the six major elements separated from hydrogen and helium by the solar wind; Earth’s silicate mantle separated from the iron core; basalt crust separated from mantle; water and other volatiles separated from rock; and now granite separated from basalt. The final result is low density continental crust made up of granitic rocks rich in silica, sodium, potassium, water, and trace elements. Its major minerals are quartz which eventually forms sandy beaches and feldspar which eventually breaks down to clay-rich soil. The Proterozoic from 2.5 to 0.5 Ga is marked by the onset of modern plate tectonics, including volcanoes and earthquakes. Plate tectonic activity (Condie, 1998; Rino et al., 2004; Hawkesworth et al., 2010) caused the cratons to move around and combine to form the continents and at times a single super-continent. Pangea that formed at about 0.3 Ga is the most familiar example of a super-continent, but is more recent than the Precambrian. Older examples in the Precambrian include Rodinia (1.0-0.6 Ga), Columbia/Nuna (1.9-1.4 Ga), and a more conjectural Kenorland (2.7-2.5 Ga) and Vaalbara (3.1-2.8 Ga). Of these, Andrew Snelling briefly discusses Rodinia in his plate tectonic flood model. The supercontinent cycles are the subject of ongoing study. Charles Q. Choi (2015). “How the Moon Formed: Violent Cosmic Crash Theory Gets Double Boost.” April 8, 2015. Kent C. Condie (1998). “Episodic continental growth and supercontinents: a mantle avalanche connection?” Earth and Planetary Science Letters, v.163, p.97-108. J. Hawkesworth, B. Dhuime, A. B. Pietranik, P. A. Cawood, A. I. S. Kemp, and C. D. Storey (2010). “The generation and evolution of the continental crust.” Journal of the Geological Society, London, v.167, p.229-248. Rino, T. Komiya, B. F. Windley, I. Katayama, A. Motoki, and T. Hirata (2004). “Major episodic increases of continental crustal growth determined from zircon ages of river sands: implications for mantle overturns in the Early Precambrian.” Physics of the Earth and Planetary Interiors, v.146, p.369-394. Wayne Slattery (1994 sic). “Where Did the Moon Come From? Part I.” Geoscience Reports, n.18, p.1-3. Wayne Slattery (1995). “Where Did the Moon Come From? Part II.” Geoscience Reports, n.19, p.1-3. Martin J. van Kranendonk, R. Hugh Smithies, and Vickie C. Bennett, eds. (2007). Earth’s Oldest Rocks. Elsevier. On Dec. 24, 1968, Frank Borman, James Lovell, and William Anders--the crew of Apollo 8--orbited the moon for the first time. During their tenth and final orbit they broadcast an unforgettable message to the largest television audience in history. They read the opening verses of Genesis 1 to a world captivated by the moment. The latest short video released by The John 10:10 Project conveys all the emotions of a cosmic look at our planet. Christmas reminds us that the One who came to be among us is also the One who fashioned our world and will come back to restore it.